We are located in Austin, Texas South Austin to be exact, the one block off of Ben White (Hwy 71) and Manchaca Rd. While we are performing the work you may walk across the street and enjoy the near by local establishments such-as Radio coffee & beer or the best hamburgers in town from Dan’s Hamburgers. 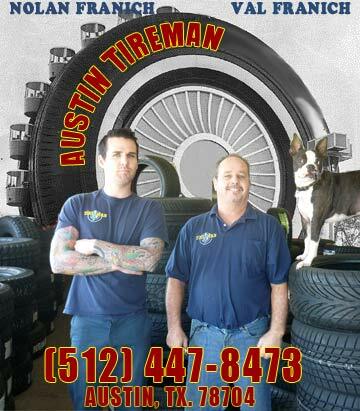 However getting down to business we offer a large selection of tires for your vehicle in many brand names. As our sign often says “We beat Discount Tire all Day long” Come visit and discover for yourself. At this family ran business you will likely meet owner Val Franich working the counter attending to every customers automotive tire or suspension need. However in the event you catch him on his day off, Val’s son Nolan often takes the helm. Last and certainly not least is our faithful mascots and ‘Tire Dogs’ named Bubba and Turtle. Bubba and Turtle love to come to work each day and jump-upon stacks of tires and wait customer petting in the lobby. Used Tires (11/13/2018)- Used tires starting at $40 Call and inquire, or stop-by today! Blog! (12/18/2016)- This is our first blog post, December 18, 2016. Many more shall follow (I hope) as well as interesting categories organizing our blog posts. We are happy to assist you with your tire and automotive suspension needs, provide you with honest information allowing you to make the best decisions for your vehicle and financial needs. We don’t push any particular brand for kick backs like many tire establishments. Our most popular advise is simply recommending whatever tires you’d buy for your own mothers vehicle. We’ll take that request and find a reputable tire at a great value resulting in a win win for everyone. Feel free to call us for any other information you may need. We’d love to have you spend a little time on our website (getting to know us), then give us a call. We would be happy to take your reservation (although typically reservation are never required) at Austin TimeMan.